Tomorrow and Friday, Google is hosting full day AdWords Summits in London. Coco from the Google AdWords team announced it on Google AdWords Help explaining that not only can you come in person, but there will be a live stream through the day. Those invited to attend are those from the AdWords Community Forum, Google's various social channels, as well as some of their UK Google Partners. The live stream will be done through the forums. At the specified time for the session, Google will update the thread linked here with the video of the session. Watch it as it's going on or watch it whenever you have time. And feel free to comment on the threads if you have questions about what the speakers are sharing. You can also use the hashtag #AWCS2014. 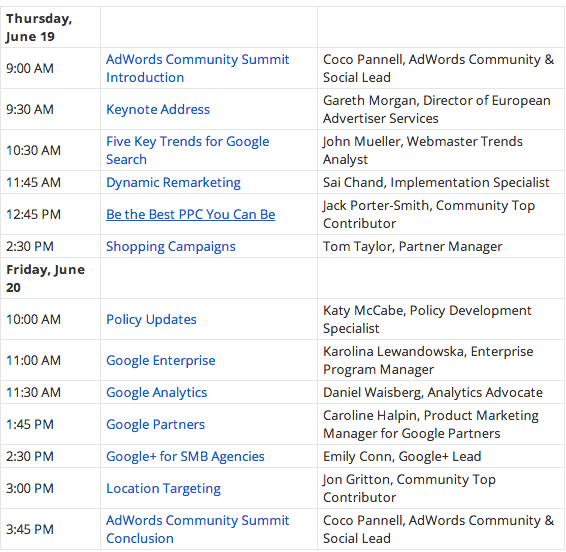 Here is the agenda, click through to the thread in the Google AdWords Help to go to the individual sessions.